This Sunday, April 14th... Latin Matinee offers a #KIZOMBA #SPECIAL. 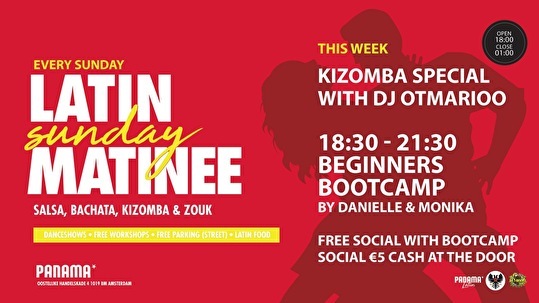 Wiith a Kizomba bootcamp for beginners from 18:30 - 21:30 by Danielle & Monika. Social from 21:30. Perfectly powdered dance floors, air conditioned rooms with additional ventilators, professional sound system, professional lighting, (inter)national dj's, (inter)national teachers and showteams, food court, wardrobe lockers, FREE street parking and parking garage at Apcoa Parking - De loodsen.